Scheduler: Change in log formats between 2.8 and 2.9 release? Has there been any change to the formatting and output of the Scheduler log text file produced on the Omniscope Server Editions? I current see the following: The date time now has a T in between date and time? Previously you had "Watcher process finished with output" text wording and now i cant see any such wording in the scheduler log. I am using the following file in the service folder as the Scheduler log "service_scheduler_log"
To see that Watcher related message you have to change the server logging level to TRACE. It will be logged into the service_scheduler_log.txt file. Remember that TRACE level will produce a verbose log, considerably increasing the size of all services logs. I can see that on the server. However i have clicked on that and then visited the log again and cannot see any finer log details.Previously we had "Watcher Processed with output" and the likes but cannot see this now ? 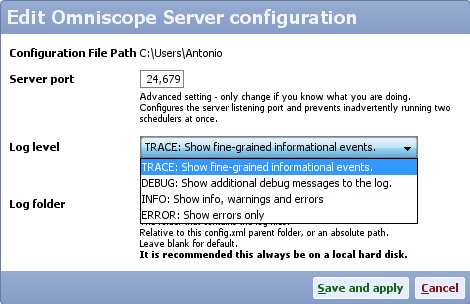 Have you restarted Omniscope Server after applying the log level settings? No i have not restarted the server , do i need to ?